Lovely gift notebook, always handy to have in your purse or by the computer; spiral binding, 160 ruled pages. Cover art by Bethany Berndt Shackelford. Scripture quote on cover: "This is the day the Lord has made. Let us rejoice and be glad in it." Psalm 118:24. 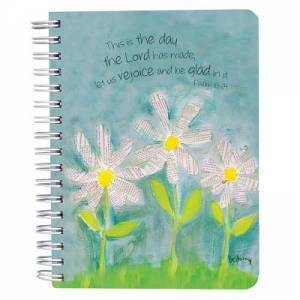 This is the Day Notebook - Psalm 118:24 was published by Christian Art Gifts in January 1970 and is our 16061st best seller. The ISBN for This is the Day Notebook - Psalm 118:24 is 6006937120129. Be the first to review This is the Day Notebook - Psalm 118:24! Got a question? No problem! Just click here to ask us about This is the Day Notebook - Psalm 118:24.